oddly in your last paragraph, you contend that the satellite record is consistent with the hypothesis that there is no positive feedback. But in fact you are quite wrong. The satellite record is consistent with surface warming as a result of enhanced greenhouse warming of the atmosphere. The predicted enhancement of troposheric water vapour has been identified (see post #173 above). How could you have come to a completely incorrect notion of the satellite record? Probably because one or two less than honest scientists (Roy Spencer is one) have repeatedly made massively profound errors during the last nearly two decades of "analysis" of this data. And although their errors have been repeatedly corrected in the scientific literature, Spencer has taken to presenting falsehoods and misrepresentations directly to the public on dodgy website and suchlike. That's what I found astonishing about your viewpoint. On this and other threads you embrace embarrasingly erroneous nonsense (The Scotese paleotemperature/paleoCO2 sketch; a German schoolteachers pathetic misrepresentation of early CO2 measurements; hearsay notions about satellite measurements)...and yet you make dull attempts to trash the pukka science. If you have evidence that "we have ice ages with high CO2 and warm eons with low CO2", why not show us? If you've evidence that "The satellite record is to an even greater extent consistent with the hypothesis that there is no positive feeedback due to increased CO2", why not show us? If you've evidence that (the satellite record) "is also consistent with the hypothesis that human activities have no measurable effect on world temperature", why not show us? We want to see your evidence Wondering Aloud. We're skeptical of individuals that embrace errant and obvious nonsense and yet attempt to downplay pukka science. We're not concerned with proof. We're interested in the science and therefore we want to see your evidence. "What errors have there been in the GISS record?" Had a look at October's Giss data? Trivail? I don't think so. Look up Wattsupwiththat latest post on Russian data included by GISS. Not really Mizimi. The GISS update for October erroneously included September data for a number of Russian stations. The error was highlighted and the data corrected. So it's not a big issue is it! There are always errors in every endeavour in life. Science isn't an exception...it doesn't proceed without errors. The important point is that errors of substance are identified (they were) and corrected (they were). Question: plants show a preference for C12 - true. But plants only have chemistry to work with ( not nuclear processes) so how do they manage that? And if they do it solely by chemistry then it follows other chemical processes can do it too.?? Oceanic plant life also prefers C12, so we should see the amount of C13 dissolved in sea water increase in respect of C12....is this the case?? Not really Mizimi. The chemistry performed by living organisms is catalyzed by enzymes. Enzymes can be exquisitively sensitive to the chemical nature of their substrates, able to distinguish between stereoisomers (e.g. L- or D-amino acids) and showing rather significant preferences in relation to different isotopes of atoms such as 1H/2H; 12C/13C; 16O/18O and so on. We don't expect to see a measurable difference in 12C vs 13C in sea water except to the extent that the exchange of aqueous CO2 [CO2(aq) <--->H2CO3] and atmospheric CO2 results in a tendency for the oceanic CO2 to equilibrate with the continually-less-depleted 12C in the atmosphere that results from the return of long, long-sequestered 13-C-depleted carbon back into the atmosphere from burning massive amounts of fossil fuels. Keep telling yourself... "it's warming rapidly... it's not the sun..."
Meanwhile back on planet Earth. Worst part about all of this is there should be a big lag before any noticeable cooling. In other words this winter should be warm based both on AGW and "it's the sun" theories. Anyone who thinks it is warm this winter is either very lucky or needs professional help. We need about +30C the rest of the year to get back up to average. At present we are about 55 C low on that. Please don't tell me it's warm in Europe (record snow falls) or Siberia (-60) that makes up for it. Spring was 3 weeks late of average and hard freeze was one month early. A couple more years of warming like 2007 and 2008 and you are going to see famine in the United States. Our local Ag reporter told us harvests were off 15% from predicted in the US this year because of low temperatures. I agree it's the sun, just not TSI. Check out the recent articles about the magnetosphere and plasma discharges. Between gravitational stresses causing increased tectonic activity, plasma discharges and changes in heat and intensity of the plasma from sunspots are looking more and more like the culprit. Too bad the IPCC never looked into this part of the science. Actually Quietman I'm not saying it is the sun, it might be, but it doesn't seem that's explaining things very well either. I think the sun is acting very weird compared to what I expected. I think uncertainty absolutely dwarfs the signal we are looking at, and every time I try to look at any indvidual piece of the puzzle it seems uncertainty grows. When I say it's the sun, I am generalizing. I see it as an engineering "root cause". Our orbit about the sun is a combination of the results of the sun in it's formation of the solar system. The combined gravitational effects of the system as a whole and the tectonic tides resultant. The effect of tectonics on the planets climate via changes to ocean circulation which in turn effect air circulation and control climate, added to the 8 minute charge cycle and irregularities in the solar wind and plasma forcing from sunspots. ie. a domino effect. I really want to know how at the current time these other external things especially orbital eccentricity compare to the past cycles in this current ice age. To me an amazing unanswered question is why are Greenland and Antarctica covered with ice? They certainly weren't this far into the last interglacial! Or as far as we know any of the interglacials. Why is the Earth so darn cold right now? There are thousands of "corrections" in the USHCN data which is best documented portion of the GISS record that are clearly incorrect. Resulting in a warming trend that is far larger than in the original data these corrctions range from undocummented to clearly incorrect. My viewpoint is astonishing to you because I started without a bias and applied the scientific method. As you frequently site papers where the authors appear unable to recopnize the concept of isolating the variable it is unsurprising that you are surprised by this method. Same here, I started out accepting AGW because a prominent scientist said it was real. I did not bother to look into it until Al Gore came out with his movie and an alarm went off "why is this ex-VP pushing AGW"? Now I see that is is all politics (lies) but I still don't see the motive. But I have learned a lot I did not know about climate so it was worth investigating. John Cook, you might want to include a link to cce's detailed description of the erroneous graph of sunspot rise since 1980 that is used in the Skeptic of the Week article. Lowest Sunspot Activity Since 1900 Tied to Temperature Drop Over the Past Two Years? by The Bully Pulpit (5 arguments) "
That article acknowledges AGW and makes no skeptical arguments at all. Why did you pick it? I've wasted a lot of my free time over the past year trying to make myself come to a conclusion of all the AGW debate. This argument, that the TSI correlation ended in 1975 doesn't prove CO2 is the driver, or disprove it either. If you look at the ENSO variations since 1975--totally dominated by warmer El Ninio events--there could definitely be a correlation there. So trying to limit the "it's the sun" argument to only TSI is misleading, because that is only one aspect of the sun's relationship with climate. Furthermore, it may be but one forcing--the oceans another, and greenhouse gasses another, and perhaps others as well. Fact is, it doesn't seem that past climate changes are very well understood, so it's fair to be skeptical that trace gasses are the primary reason for this climate change. Okay I am in radio, and solar flair activity over the last 10 years has been horrible. Just two years ago the news was reporting unusually high solar flair activity. Numerous articles were published about the sun spot cycle being totally confusing and overly active. But the chart says that solar flair activity is down? So? Anyone want to tell me just who it blowing what kind of smoke and where? If you really want to find out about solar flair activity and its rise in the last ten or so years then go to the source. http://www.nso.edu/ This is the national solar observatory in Sun Spot New Mexico. They are the last word in the suns activity. I can make a chart and with a little credablity I can sell it to you. Does it make it ture? No it doesn't, but what it does do is negate the argument and cloude the facts. June 6, 1991 - Severe sun storm threatens utilities [New York Times, June 6, 1991, p. A16]. October 29, 2003 - The Halloween Storm - This Halloween Storm spawned auroras that were seen over most of North America. Extensive satellite problems were reported, including the loss of the $450 million Midori-2 research satellite. Highly publicized in the news media. A huge solar storm has impacted the Earth, just over 19 hours after leaving the sun. This is one of the fastest solar storm in historic times, only beaten by the perfect solar storm in 1859 which spent an estimated 17 hours in transit. A few days later on November 4, 2003 one of the most powerful x-ray flares ever detected, swamped the sensors of dozens of satellites, causing satellite operations anomalies….but no aurora. Originally classified as an X28 flare, it was upgrade to X34 a month later. In all of its fury, it never became a white light flare such as the one observed by Carrington in 1859. Astronauts hid deep within the body of the International Space Station, but still reported radiation effects and ocular 'shooting stars'. "This is the strongest flare we've seen in the past 30 years," said Leon Golub, an astrophysicist at the Harvard Smithsonian Center for Astrophysics. The website spaceweather.com lists it as third highest ever recorded in X-ray flux. The main mass of charged particles should hit the Earth's magnetosphere about 30 hours after the flare, about 1800 GMT on Wednesday. Celestial fireworks in the form of aurora will follow as the energetic particles interact with the Earth's magnetic field. Impressive auroras are likely at latitudes much lower than normal. The fluctuations caused in the magnetic field affect electronic systems and power grids by inducing currents in conductors. The severity of the storm and its impacts on electronic equipment will depend on the orientation of the magnetic fields in the ejected particles, relative to the Earth's magnetic field. If the particles' fields oppose the Earth's, the interaction will be extremely intense. But a parallel direction will reduce the impact. Present instruments cannot measure that orientation until the particles hit. The possible effect on electric power grids is a significant concern after this year's major blackouts in the US and Italy. Geomagnetic storms can induce voltage fluctuations that destabilise vulnerable power grids. Tuesday's flare is larger than the 1989 storm that knocked out the Quebec power grid. "Geosynchronous communications satellites are likely to be affected," warned John Kohl, a solar astrophysicist at Harvard-Smithsonian, who shut down his own ultraviolet experiment on the Solar and Heliospheric Observatory (SOHO) soon after learning of the flare. BUt our chart makers would have us believe that solar flair activity has actually fallen. I suppose they don't think we listen to the news or pay attention so it is easy to slip one over on us and basicly LIE! Okay they don't lie, they just bend the truth to fit thier needs. Could someone explain, why is it so important to see a trend in the suns radiation? Isn't it enough to say that it stabely radiates more than it did a few centuries ago? You don't have to warm more and more to boil the water. It's enough to set your oven to a stable temrature. Since the 1970's, there has been a calculated rise in the GMT of around 0.5C most of which is attributed to the effects of man enhancing atmospheric CO2 levels by burning fossil fuels. In order to counter this argument sceptics advance other arguments such as in this thread - namely that the sun is more active and that will cause an increase in solar radiation and thus warm the earth. So it is then necessary to see if such is the case. If there is no apparent rising trend in solar radiation this would negate the sceptics argument. ( the Fairbridge 'Curve') etc. Taking a single effect in isolation is an approach adopted by both sides and is counter-productive to a full understanding of the process. It's enough to set your oven to a stable temrature.==========Answer. The graph would suggest that solar radation was stable. But if you have read the post I made which came right from the news media. Solar activity in the last ten years has risen. The reoport suggest a stable sun cycle. When all the evedence is to the contrary. The next question that would come to mine, is why would a false report be published that countered the suggested cause of global warming as solar related. I am open to all arguments but in the face of such evidence you can understand why I would become skeptical. But even regardless the news: the graph shows that, the SR was lower before 1935, than it is now. If the Sun is responsible for the supply of 99,9% of Earth's energy (maybe less, maybe more - I don't really know) this rise, despite its now being stable (or not) for the last few decades, may be the cause. Maybe somewhere in between 1365,6 and 1366 lies the border, exeeding which, the earth can no more cool off enough? But I agree: there are much more factors to think about. So maybe I'm wrong: the rain in Fabuary, and plus 10 C, on 51 N and 17 E is just a possible fluctuation of the climate. But if I am wrong, can anyone tell me something for sure? Theory of chaos - isn't it? There are a couple of factors involved. GHG is one. The sun another and plate tectonics another. The sun provides most of the heat and the earth, via plate tectonics both provides additional heat and determines how it is distributed, ie. it controls ocean patterns and oscillations which in turn control the air circulation and weather patterns. GHGs maintain the heat but can not cause or provide any heat. This is why the term "global warming" is incorrect. We have temperature anomalies appearing in several places on the planet, most notably is the west antarctic penn. and northern Greenland. There are others but these two shine out because of the ice melt. They are both (as well as others) tectonically driven (what we term as "root cause" in engineering. (Engineers look for root cause because fixing symptoms gets you nowhere, it's a bit like taking aspirin for a flu - you stop the fever but you still are sick). 2. The Earth's molten core. If these two energy sources were elliminated, the Earth would cool to near absolute zero. The Earth's atmosphere is NOT an energy source. The Sun is the ONLY energy source in the following diagram. Do you see the amount of Solar Radiation absorbed by surface of the Earth?....it's 168 w/m^2. Do you see the amount of Back Radiation from the Atmosphere that is absorbed by surface of the Earth?....it's 324 w/m^2. Do you see the amount of Surface Radiation from the Earth?.....it's 390 w/m^2. Do you agree that the Sun is the ONLY energy source in this Energy Budget Diagram? Do you agree that the average Atmosphere temp is Colder than the average Earth's Surface temp? Does the Earth's surface radiate MORE energy than it "consumes" or receives from the Sun? Does the Back Radiation absorbed by the Earth's Surface exceed the energy it receives from the Sun? Does the Back Radiation not come from a colder atmosphere? "The term perpetual motion, taken literally, refers to movement that goes on forever. However, the term more generally refers to any closed system that produces more energy than it consumes. Such a device or system would be in violation of the law of conservation of energy, which states that energy can never be created or destroyed." "Perpetual motion violates either the first law of thermodynamics, the second law of thermodynamics, or both"
"A perpetual motion machine of the first kind produces energy from nothing, giving the user unlimited 'free' energy. It thus violates the law of conservation of energy." The Energy Budget Diagrams show 342 w/m^2 for the "Incoming" Solar Energy above the Earth's atmosphere. 67 w/m^2 is absorbed by the atmosphere, 77 w/m^2 is reflected by clouds and 30 w/m^2 is reflected by the surface. This leaves 168 w/m^2 absorbed by the Earth's surface. The AGW Energy Budget Diagrams state that the Solar energy actually reaching the Earth's surface is only "an average" of 168 w/m^2. However, the method they use for their calculation involves representing the spherical earth as a disk. While this calculation is mathematically correct to determine the "average" solar flux through the disk, it does not represent the actual variation in Solar flux. Most of the direct(straight on)absorbtion of Solar energy occures near the equator (even with the Earth's changing axis). The Polar regions absorb far less Solar energy because the energy is received at an angle. Near the equator the Solar flux is measured as high as 1000 w/m^2...which is vastly higher than the 168 w/m^2 average. Amount of captured solar energy depends critically on orientation of collector with respect to the angle of the Sun. Under optimum conditions, one can achieve fluxes as high as 1000 Watts per sq. meter"
The Oceans have an emissivity near 1, which means that they will absorb just about all Solar energy available and heat up. and solving for T we get T = 364.42 deg K or a whopping 91.42 deg C!! On average, the Ocean mean surface temp at the equator is a much lower 29 deg C.
Also, the mean Ocean surface temp for the entire planet is about 18.69 deg C.
It is very possible that the Sun's heating of the Oceans (which is about 70% of the Earth's surface)can account for most, if not all, of Earth's +15 deg C average temp. LW = Surface Radiation - Back Radiation Absorbed by Surface = 396-24=66, just as Trenberth said. LH is latent heat, SH is 'sensible heat' (not in Fig. 7). So this gives 168=66+78+24, which is correct for expressing Conservation of Energy at the surface. Post #246 was really directed as a response to #243, not #244. Yet it is indirectly applicable to #244 also. But this post is directed to another subtopic of #243, the alleged violation of the 2nd Law of Thermodynamics. The application of the 2nd Law is not that straightforward. This becomes more clear if we use a better source for the wording of the Law, better than Wikipedia or the Hyperphysics site. I use The Pauli Lectures on Physics Vol 3, which is on Thermodynamics, and has: "There does not exist a device which, working in a cycle, permits heat to be transferred from a reservoir at one temperature to a reservoir at a higher temperature without compensating changes (that is, unless mechanical work is done or energy is added by some other means)". But we have both of these compensating changes: mechanical work is done on the atmosphere itself as it is heated by radiation, and energy is added from the sun. Besides: the radiation budget diagrams like Kiehl and Trenberth's Fig. 7 do not SHOW a cycle. So in order to show an alleged violation, one would have to show how to use what IS shown in Fig. 7 to construct a cyclic process transferring heat to a hotter reservoir without compensating changes. This is actually not a simple construction, which is why people do not usually resort to it. Instead, they analyze such situations by using, for example, the Gibbs variational method, which automatically guarantees compliance to both First and Second Laws. The Sun is the ONLY energy source in Fig.7 of Kiehl & Trenberth's Energy Budget Diagrams. In-coming Solar energy and out-going IR energy is balanced at the top of the atmosphere. However, below the upper atmosphere Conservation of Energy is violated. The Law of Conservation of Energy always applies....including the Earth's surface. The Surface of the Earth absorbes 168 w/m^2 of Solar Energy (and is the ONLY energy source). The Atmosphere and the Earth are NOT energy sources. The Earth's surface is shown to be radiating 390 w/m^2. The Back Radiation from the atmosphere (shown to be absorbed by the Earth's surface) is 324 w/m^2. Both these quantities (390 w/m^2) and (324 w/m^2) exceed the ONLY energy source (the Sun) which provides only 168 w/m^2. The Law of Conservation of Energy states: "Energy can never be created or destroyed". There is, obviously, energy "creation" in this situation....an impossible outcome. "The application of the 2nd Law is not that straightforward. This becomes more clear if we use a better source for the wording of the Law, better than Wikipedia or the Hyperphysics site. In fact, MattJ found it necessary to explain what "compensating changes" meant....which is clearly stated in the Hyperphysics definition. Both defintions say the same thing....as one would expect. MattJ seems to have missed the point of the Sun being the ONLY energy source. "But we have both of these compensating changes: mechanical work is done on the atmosphere itself as it is heated by radiation, and energy is added from the sun." What MattJ is trying to say is that there is "mechanical work" done to move heat energy from a Colder atmosphere to a Warmer Earth. This would have to be the equivalent of a Refrigerator in the sky....which does not exist. "The second area of solar cookers I looked at was their potential use for cooling. I tested to see how effective they are at cooling both at night and during the day. During both times, the solar cooker needs to be aimed away from buildings, and trees. These objects have thermal radiation and will reduce the cooling effects. At night the solar cooker needs to also be aimed straight up towards the cold sky. During the day the solar cooker needs to be turned so that it does not face the Sun and also points towards the sky. For both time periods cooling should be possible because all bodies emit thermal radiation by virtue of their temperature. So the heat should be radiated outward. Cooling should occur because of the second law of thermodynamics which states that heat will flow naturally from a hot object to a cold object. The sky and upper atmosphere will be at a lower temperature then the cooking vessel. The average high-atmosphere temperature is approximately -20 °C. So the heat should be radiated from the cooking vessel to the atmosphere." This link shows that heating cannot occur from the atmosphere. In fact, the article shows how to COOL items placed in the Solar Oven at NIGHT AND DAY! All you have to do is point the Oven away from the Sun during the Day and the Oven will transfer heat from the WARM object in the Oven to the COOLER atmosphere! It can even be used to produce ICE when the ambient air temp is +6 deg C! "If at night the temperature was within 6 °C or 10°F of freezing, nighttime cooling could be used to create ice. Previous tests at BYU (in the autumn and with less water)achieved ice formation by 8 a.m. when the minimum ambient night-time temperature was about 48 °F." This confirms the validity of 2nd Law of Thermodynamics....heat energy CANNOT flow from Cold to Warm objects. And, there is no Refigerator in the sky to force energy flow from Cold to Warm. PS: Matt, I don't see any relevance of your posts to my Post #244. I have read some toung in cheek remarks about volcanic activity in the oceans. Even a bit of back handed humor. The ability to simply negate the data or simply make the statment that "I don't have the time to investagate the possibilities" seems a bit negitive. Can anyone be so positive of a condition that they simply ignore other possibilities? Solar radation is an extream factor in earth heating or cooling. Any changes in the suns activity will cause weather and temperatures change. The argument that solar flair activity has not effected the earth temperature has yet to be proven. Techtonic activity according to USGS is more active in this centry than any other centery. Yet this inofrmation is being ignored. (Before anyone jumps on the train lets see which way it goes.) Volcanic activity causes cooling, not heating of the atmosphere. Dust particles tend to block the heat and cool the temperagure of the earth. However, underwater volcanic activity does two things. One, it heats the waters through magma flow welling up through the cracks within the crust, and saturates the water with CO2, two it changes the prevailing currents of the oceans. Recent events has cuased the currents to change in one part of the world, when a 100 foot tall 1000 mile wall welled up Near Indonisa. Thus, chanigng the water currents forever in that area. Before we jump on one wagon, shoulden't we be examining every aspect of this situation, rather than simply pointing to one suspect and yelling. "He's the guilty party!" Not only is it non scientific but smacks of politics, more than science. Okay, let me ask this question. If we suddenly decrease the amount of CO2 by lets say, 10%. How much will that drop the over all global temperature? How much moisture is in the atmosphere at this moment? Where will that moisture go when the temperature suddenly drops? Has anyone considered the results of a sudden drop in over all CO2 content in the atmosphere. The Sun is the ONLY energy source in Trenberth's Energy Budget diagram. The Earth and the Earth's atmosphere are NOT energy sources. - Incoming Solar Energy, at the top of the atmosphere, to be 342 w/m^2. - Surface Radiation of the Earth is 390 w/m^2!!! EVEN IF ALL THE INCOMING 342 WATTS/M^2 OF SOLAR ENERGY REACHED THE EARTH'S SURFACE (which it does not)...IT IS IMPOSSIBLE FOR THE EARTH'S SURFACE TO RADIATE 390 WATTS/M^2!! Since the SUN is the ONLY energy source....Trenberth has the Earth's Surface CREATING ENERGY! This is ABSOLUTE PROOF that Trenberth's Energy Budget VIOLATES THE LAW OF CONSERVATION OF ENERGY! "Temperatures of the plasma at the earth are found to be about 150,000°K, approximately a factor of ten lower than the estimates for the temperatures of the bulk of the coronal plasma found in the upper atmosphere of the Sun." Please click on the RED link above for their page and full explanation. With regards to the second law of thermodynamics, what it says about spontaneous heat flow only being from warmer to cooler and not the other way around - it is important to remember that this is NET flow. The NET flow of heat can be and often is the difference between two larger values, the heat flow only in one direction and the heat flow in the opposite direction. The net radiant heat flow between a red hot object and a white hot object is from the white hot object to the red hot object, but there is radiation going in both directions; furthermore, that radiation could be passing through another object which may be blue hot or as cold as space - depending on it's optical properties, it may participate in the radiant heat flows, with some net heating or cooling, but however it works out, the net heat flow between just two of whatever number of objects is involved is from hotter to colder. The difference between 390 and 342 is 48. That is the radiant cooling of the surface of the Earth to the cooler atmosphere and the cold of space. It is less than the solar heating of the surface; the difference is balanced by convection, which tends to link changes in temperature between the surface and various levels of troposphere together, because heating one part up without heating the other parts changes the convection rates in such a way as to heat up the other parts, generally; above the troposphere, convection is much less important in the global average vertical energy fluxes - but there is some large-scale overturning driven by a small upward flux of kinetic energy from below (generated by the heat engine of the troposphere when hot air rises and cold air sinks, etc. ); this upper level overturning IS a refrigerator/heat pump - the kinetic energy is used to cool off parts that are colder and heat up parts that are warmer, across latitudes. black2deep - "The argument that solar flair activity has not effected the earth temperature has yet to be proven. Techtonic activity according to USGS is more active in this centry than any other centery. Yet this inofrmation is being ignored. (Before anyone jumps on the train lets see which way it goes.) Volcanic activity causes cooling, not heating of the atmosphere. Dust particles tend to block the heat and cool the temperagure of the earth. However, underwater volcanic activity does two things. One, it heats the waters through magma flow welling up through the cracks within the crust, and saturates the water with CO2, two it changes the prevailing currents of the oceans. Recent events has cuased the currents to change in one part of the world, when a 100 foot tall 1000 mile wall welled up Near Indonisa. Thus, chanigng the water currents forever in that area. Before we jump on one wagon, shoulden't we be examining every aspect of this situation, rather than simply pointing to one suspect and yelling. "He's the guilty party!" Not only is it non scientific but smacks of politics, more than science. " Lack of proof or disproof can leave possibility, but when well-understood apects of a system account for the observations quite well, it's a reasonable expectation that the unknowns are not so important. Furthermore, without proposing at least some plausable or feasable mechanism to connect one phenomena to another, simply asserting that one might be connected to the other is not particularly useful - the same argument method could be used to suggest just about anything - hence the logic of Occam's razor. What is the significance of a connection? Just about everything may be connected somehow, someway, to everything else, but not all connections are equal or of the same type. If it could be shown that changes in the solar wind and geomagnetic field are somehow causing a climate change that is significant relative to anthropogenically-forced effects, it would not necessarily be a significant change in global average temperature with the same significant regional and seasonal variations as caused by any other forcing. Obviously solar UV variability will have some effect on upper atmospheric conditions that are different than greenhouse effect changes (something climatologists are aware of). The solar wind, by affecting the magnetosphere, can affect the ionosphere, but what do any of the resulting changes do to the troposphere and stratosphere? The great majority of geothermal heat flux at the surface is from the slow steady heat transport through the crust; very little is direcly from volcanism, and so it is hard for geothermal heating to fluctuate much on global and regional scales; the heat flux itself is generally on the order of 0.1 W/m2, much smaller than just anthropogenic CO2 forcing thus far; much much greater forces (Winds, climate-driven buoyancy variations, tides) shape the ocean's conditions and dynamics and variability in these dwarf any short-term volcanic effects (Panama wasn't built in a single millenium). Geologic outgassing of CO2 is very slow and can only act to change climate signicantly over time periods of at least hundreds of thousands of years. ""Temperatures of the plasma at the earth are found to be about 150,000°K, approximately a factor of ten lower than the estimates for the temperatures of the bulk of the coronal plasma found in the upper atmosphere of the Sun." Please click on the RED link above for their page and full explanation." What is the point you think it makes? in case this helps visualize the situation: if I'm the white hot object and you're the red hot object, that the net direct thermal radiation exchange between them must be from me to you and not the reverse does not imply that there is no radiation in the opposite direction, for if it did, it would imply that I could not see you. The second law of thermodynamics actually implies that at any given wavelength, if you can see me, then I can see you. An optical filter could be used so that my yellow and blue wavelengths would reach you but neither of us could see each other's red wavelengths. For that matter, you're emissivity and absorptivity (they must be equal if at local thermodynamic equilibrium, and if not in local thermodynamic equilibrium, then otherwise cool objects might appear hot - as in fluorescence, etc. - the second law of thermodynamics would still apply but there would be some flow of energy not associated with a simple measure of temperature in that case (work, free energy, etc.)) could be zero at those shorter wavelengths, and then I couldn't see you and, since you wouldn't absorb any of my shorter-wavelength radiation, you wouldn't 'see me' either; the point being that seeing each other is a two way street - if I am smaller or have lower emissivity at any given wavelength, that reduces the direct radiative energy exchange in both directions between us, as I would emit less to you and absorb less from you, etc. (PS what if my shorter wavelengths were blocked by an obstacle but the red wavelengths could pass between us - well, the net radiant energy flux would still be from me to you because for a given emissivity (as a function of wavelength that is not changing in this scenario), radiant intensity increases at all wavelengths as temperature increases; it only increases much more at shorter wavelengths. If a blue hot object were in between us and it were opaque, we couldn't see each other; there would be no direct radiant energy flux between us (at the wavelengths for which this occurs). If it were transparent, we couldn't see it and it couldn't see us; our radiation would pass through it and it would be as if it weren't there. If it were perfectly reflective, we'd only see ourselves (in that direction), and effectively radiating to objects with the same temperature and getting the same back (in that direction). If it were somewhere in between, one could describe the total radiant energy flow among the three objects as the sum of three parts: the direct radiant exchange between you and me, the direct exchange between you and the blue-hot object, and the direct exchange exchange between me and the blue-hot object; each individually has a net energy transfer from warmer to cooler; the total gain or loss by each depends on the optical properties and temperatures (and sizes and distances, etc.) of all three. Yes, with radiation, what you see is what you get; the exchange of energy among objects of finite size, with neither enveloping the other, (as opposed to two infinite sheets or concentric spheres) that are farther apart, is smaller because they appear smaller to each other. The intensity - the radiant flux per unit solid angle (analogous to how bright an object looks within a given unit of the field of view) - is conserved in the absence of absorption, emission, and reflection and scattering (it is even conserved during refraction in the absence of those other things). What if there is no net energy exchange? If you wrap a white hot object in perfect mirrors (that have zero thermal conductivity and are not fluids), there is no net energy flow, but if you stepped inside the white hot object, you'd see radiation coming from the object and going back to the object equally in any two opposite directions. The sun heats the Earth and atmosphere. Earth loses heat to the atmosphere and space. There are convective fluxes from the surface to the troposphere. There are radiative fluxes among the surface, space, and all levels of the atmosphere; there is net radiant cooling to space from both the surface and all parts of the atmosphere, which is about equal to the total radiant fluxes from the surface and all parts of the atmosphere, since space is radiating very little (it looks like a blackbody near absolute zero). 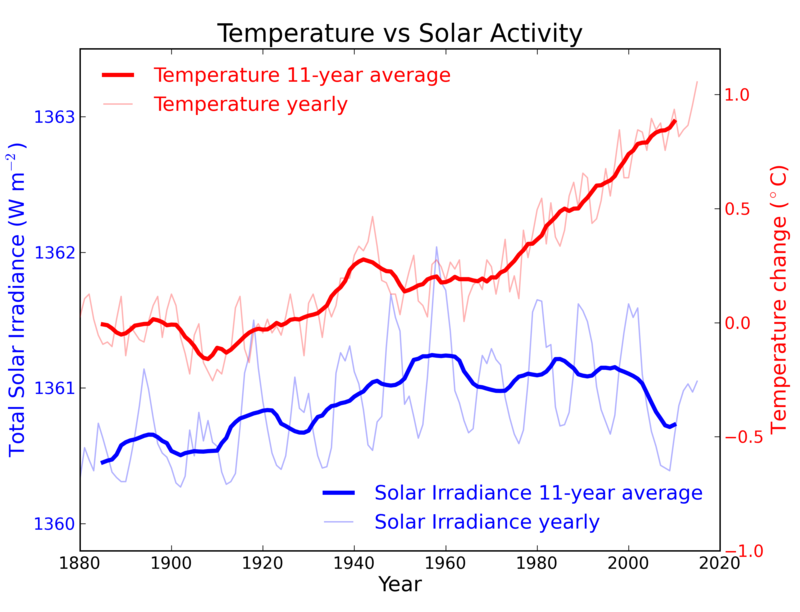 This is in total balanced by solar heating, but not everywhere, because there are net radiant fluxes among the surface and levels of the atmosphere, which all combined, and combined with convection, including horizontal heat transport, averaged over the year and over interannual variability, for a steady long-term climate, balance the spatial displacment between solar heating and longwave cooling to space. The flow of entropy is equal to thermal energy divided by temperature; for radiant energy, the entropy gained or lossed by an object by radiation is equal to the radiant energy gained or lossed divided by the temperature of the object. The direct net radiant energy fluxes between any pairing of subdivisions of the climate system is from warmer to cooler (provided the subdivisions are defined to be small enough so that they are each approximately isothermal within themselves - remember, 'local thermodynamic equilibrium'), which insures that, following the flow of energy, entropy is increasing, and as energy is conserved, entropy does not decrease. That satisfies the second law of thermodynamics. Of course the entropy of the climate system can fluctuate up and down a little as the flow of entropy and energy to space can fluctuate; this does not violate the second law of thermodynamics. If equilibrium temperature were determined by radiation along, the lowermost atmosphere would be unstable to convection (in general - not at the poles, at night, etc., but for a representative global average). Convection tends to maintain the change in temperature with height (the lapse rate) near a moist-adiabatic lapse rate - with regional variations, of course. From idea gas laws, it can be shown that warm air rising and cold air sinking, either by localized overturning (cumulus convection) or larger scale overturning (Hadley cells, Walker circulation, monsoons, extratropical baroclinic waves), converts some thermal energy into kinetic energy, as in a heat engine. Ultimately the kinetic energy is lossed to friction, thus turning into thermal energy, but with a different distribution, with higher entropy. There is not much recycling of kinetic energy to kinetic energy after frictional dissipation. However, kinetic energy can be converted back into thermal energy when wind blows from low pressure to high pressure, and cold air is forced to rise as warm air sinks. This can and does happen under some conditions. Kinetic energy is very important as winds and currents are important in shaping the climate, but it involves a rather small amount of energy in comparison to the thermal energy budget of the climate system. "Ultimately the kinetic energy is lossed to friction,"
"but it involves a rather small amount of energy in comparison to the thermal energy budget of the climate system." And so one can, at least on the large scale and in general, approximate the thermal energy budget without considering conversion to and from kinetic energy. I don't see any mention of "NET" heat flow. I do see the words "not possible" though.....unless work is done to accomplish this flow. Work would involve the natural creation of an equivalent "refrigerator in the sky" which does not exist. This is proven by actual measurements conducted at the Physics Dept.of Brigham Young University, Utah. Also, you have not addressed the fact that "the Sun is the ONLY energy source" in Trenberth's energy budget diagram. Unless the Earth "created" energy....It cannot radiate more energy than it receives. This the most basic fundamental physics. Clearly, the 390 w/m^2 that the surface of the Earth radiates exceeds the in-comming Solar radiation of 342 w/m^2. Unless you have a different "definition" of the Law of Conservation of Energy ("ENERGY CAN NEVER BE CREATED OR DESTROYED") then 390 is greater than 342 and therefore VIOLATES the Law of Conservation of Energy. THERE IS a refrigerator in the sky - in which, above the tropopause, kinetic energy emanating from below does work, lifting colder air and pushing warmer air down. Because of changes in pressure, rising air cools adiabatically and sinking air warms up adiabatically - in this adiabatic process, there can be a net reduction or gain in thermal energy as some kinetic energy is either produced or consumed (does work). When warm air rises past sinking cold air, the average temperature decreases; the change in thermal energy corresponds to a gain in kinetic energy. The reverse can happen, and has importance particularly above the tropopause; it is most obvious in the mesosphere, where circulation driven by kinetic energy from below cools off the coldest air. But that involves a rather small amount of energy and can be ignored to a first approximation in accounting for the heat energy budget of the climate system. The radiant heat transfered from the atmosphere to the surface is less than that transferred from the surface to the atmosphere, and that does not violate any physical laws. "I don't see any mention of "NET" heat flow." Okay, but that's what they mean. The world doesn't make sense if otherwise - why? Consider this: if the sun were next to a blue-hot star, would the sun (that part of it facing the blue-hot star) go dark simply by being next to the other star? Does no light from the sun reach any star that is hotter? With a powerful enough telescope, I am quite sure you could see the sun from Sirius. What you are saying suggests otherwise, that the sun's light must not reach anywhere where temperatures are greater than the sun's photosphere. That when there is a lightning bolt, any photons from the sun must avoid it. Where is energy being created? Add up all the thermal fluxes into the surface, out of the surface, and you will see they are equal (for equilibrium conditions). Do the same for the atmosphere; you will find the same result. The atmsophere and surface both radiate in each other's directions and recieve some of each other's emissions. This happens because while one is colder than the other, niether is at absolutely zero, nor is either perfectly transparent at all relevant wavelengths. The atmosphere does thermally emit radiation, and some of it reaches the surface. "Unless the Earth "created" energy....It cannot radiate more energy than it receives." It IS NOT radiating more than it recieves. You insist the sun is the only source of energy here, which is essentially true (geothermal and tidal heating are minute in comparison), but you seem to be forgetting about it here. The surface gets heat from the sun and the atmosphere. The atmosphere gets heat from the sun and the surface. Start at absolute zero on Earth, so nothing is radiating any energy. Turn on the sun. The surface and atmosphere now recieve heat. Neither is radiating any heat. Thus they are gaining thermal energy. Temperatures increase. Temperatures increase until the surface and atmosphere combined radiate to space the same amount of energy per unit time that they together absorb from the sun. But within that system, there is additional radiation back and forth, because the atmosphere absorbs some of the radiation from the surface, and the atmosphere radiates some energy downwards (in fact, different parts of the atmosphere radiate energy to and from each other, and because the lower atmosphere is generally warmer than the upper atmosphere (the thermosphere, etc, is a very small fraction and doesn't have much direct effect on energy budgets of other layers), the atmosphere actually radiates more strongly downwards than upwards - it looks warmer from below than from above because the cooler upper atmosphere blocks some radiation from the warmer layers beneath, and vice versa in the other direction)). The surface temperature will rise (or fall) until it's combined heat loss from radiation and convection balances it's heat gain from the sun and atmosphere. Each layer of the atmosphere will also have changes in temperature until it's heat loss by convection and radiation balances it's heat gain from convection and radiation, including radiation from the sun. If you have a hot object and a cold object in a room and turn a fan on to circulate the air, convection will tend to bring heat from the hot object and to the cold object. However, unless the air is ever at absolute zero, there will be some heat energy transported to the hot object; it will just be less than what is removed (air leaving the hot object will be hotter than air approaching it, but the air approaching it can have some non-zero temperature, and thus does have some heat energy, and when it comes into contact with the surface, heat energy can be exchanged in both directions as molecules bounce against each other, but the net effect is to transfer heat from the hotter object to the cooler air). When that colder air comes into contact with the hot object, the greater thermal energy of the hot object's particles (molecules, etc.) is such that collisions on average transfer energy to the colder air molecules; however, at any given temperature, there is a distribution of energies of the particles, and occasionally, an energetic molecule in the cold air will collide with a less energic molecule of the hot object. Taken all such collisions as a subset of the whole process, one finds a transfer of energy from the cold air to the hot object. This is less than the reverse transfer by all other collisions. And so on with thermal diffusion through the air. Random particle motions tend to spread out particles from one area over time. Collisions are very important, but even without them, over time, heat will diffuse outward from a hot region and inward to a cold region; the same mechanism tends to result in mixing of substances, such as when the aroma of bread spreads out in the air (although convective transport - turbulent mixing, as opposed to molecular diffusion - is often important as well in that process). But this motion is random, which means that some particles with greater energy will occassionaly approach the hotter region, etc. Also, most molecules at any given time will have some thermal energy (or else they would not be moving and so diffusion would be impossible), so the less energetic molecules that diffuse into the hot region still carry some thermal energy with them; it just happens to be, on average, less than the energy which is being taken away. Notice that thermodynamics deals with temperature and thermal energy, which deals with the kinetic energy of a distribution of random particle motions, that approaches an equilbrium DISTRIBUTION as energy becomes 'thermalized' - maximizing the entropy for a given amount of energy and reducing the free energy so that the substance as a whole can be described with a single temperature (in the absence of collisions, seperate populations of particles could move through each other while retaining their initial temperatures). Thus, thermodynamics necessarily involves statistics and probability distributions; the net effects are the sums of many individual random events. The most succinct way to state the second law of thermodynamics is that the entropy of a closed isolated system never decreases; it can decrease if the system is not closed or not isolated and interactions occur such that the production of entropy elsewhere allows a reduction in entropy in the system. The flow of entropy is equal to the flow of heat energy divided by temperature. When heat energy flows from hot to cold, the entropy of the cold body increases more than the entropy of the hot object decreases because the same heat energy entering the cold body brings more entropy per unit energy into the cold body than it takes upon leaving the hot body. A heat engine working in reverse is a heat pump - a refrigerator if the enhancement of cold is the purpose. The maximum coefficient of performance possible is determined by what would just conserve entropy; for the same difference in temperature, it involves the same ratio of free energy to heat flow at the high temperature and free energy to heat flow at the cold temperature as those for a heat engine, except the coefficients of performance are the reciprocals of those ratios. Entropy also increases when two substances are mixed, and variations in composition can be a source of free energy - for example, in reverse osmosis, work is done to remove salt from water. Osmosis could be used to generate usefual energy from the mixing of fresh water and salt. Of course, there are other complexities; entropy depends on temperature and mixing can produce a change in the thermal energy. In general, any process (physical, chemical, etc.) can happen spontaneously if, taking into account diffusion, changes of state, changes of heat energy and temperature, pressure, etc, the total entropy increases. Thermodynamic equilibrium occurs when entropy is maximized (for a system in isolation - no mass or heat inflow or outflow); a system that is not in thermodynamic equilibrium possesses some available free energy; rather than destroying the free energy approaching thermodynamic equilibrium, one could allow a much smaller increase in entropy while extracting work from the system, until a different equilibrium is reached (it won't be the same equilibrium because the system has exchanged at least energy with it's surroundings). Kinetic barriers may exist that prevent a system from spontaneously reaching thermodynamic equilibrium or slow that process; such barriers can be used to regulate processes to preserve free energy; in some chemical and physical reactions, catalysts can form a tunnel through such barriers, making the barrier much smaller. in your comment 248 above. Going just by the excerpt that you provide, there is no proof that radiant heat is not recieved by the surface from the atmosphere. What is demonstrated is that this radiant heat flux is less than that upward from the surface (and the solar cooker). The excerpt even contains a statement that substances (depending on optical properties) thermally emit radiation according to their temperature. This emission only goes all the way to zero when the temperature goes all the way to zero - or when the substance is perfectly transparent and/or reflective. At any given wavelength, a material will emit radiation as a function of temperature and the material's emissivity; at local thermodynamic equilibrium, emissivity = absorptivity, and emissivity cannot be less than 0 or greater than 1. A perfect blackbody has emissivity = absorptivity = 1. Blackbody radiation intensity (energy flux per unit area per unit solid angle - multiplying by the cosine of the angle from the perpendicular to a surface and integrating over all directions that pass through the surface from one side to another gives the radiant flux per unit area from or passing through the surface in that direction relative to the surface) at any given wavelength, per unit wavelength, increases at all wavelengths as temperature increases, but increases much more at shorter wavelengths. Because many common processes do not involve nuclear reactions, thermodynamic properties are often calculated without taken into account entropy and free energy associated with nuclear reactions. This essentially leaves those processes out of the defined system. Without changing the definition of the system, nuclear reactions would occur outside the system and potentially add to and/or take from the system mass, energy, and entropy; alternatively, one can evaluate the thermodynamics of nuclear reactions as part of a system. You said that "THERE IS a refrigerator in the sky" and "Going just by the excerpt that you provide, there is no proof that radiant heat is not recieved by the surface from the atmosphere." I disagree with both your statements. The Trenberth Energy Budget shows that the Solar Radiation absorbed by the surface of the Earth is 168 Watts/m^2 and reflected by the surface is shown to be 30 Watts/m^2. Both these figures add up to 198 Watts/m^2 and would be available to any Solar Oven. "For both time periods cooling should be possible because all bodies emit thermal radiation by virtue of their temperature. So the heat should be radiated outward. There, clearly, is no "refigerator in the sky"....and the results of the actual measurements absolutely confirm the validity of the 2nd Law. So, we have an actual measurement that complies with the 2nd Law....this is not a surprising result! The surface gets heat from the sun and the atmosphere. The atmosphere gets heat from the sun and the surface." 1. Trenberth's Energy Budget does not include ANY other energy source other than the SUN! 2. The Earth and the atmosphere receive their energy from the SUN. 3. The Earth and the atmosphere ARE NOT ENERGY SOURCES. Your posts seem to dispute this fact, but as part of your logic you have also violated the 2nd Law of Thermodynamics. Adding fluxes that include "a refrigerator in the sky" to force the Back Radiation to be absorbed by the Earth is the Violation of the 2nd Law. The actual measurements conducted at the Physics Dept.of Brigham Young University, Utah prove this. All the energy radiated by the Earth and the atmosphere could still NEVER EXCEED the 342 w/m^2 Solar Energy! I forgot to include this. If there were "a refigerator in the sky" the atmosphere would have to be warmer than the Earth. The atmosphere is, obviously, cooler than the Earth.....therefore...there IS NO REFIGERATOR IN THE SKY! "Temperatures of the plasma at the earth are found to be about 150,000°K"
Magnetic holes allow some of this heat in. My point that there is a refrigerator in the sky (probably many at any given moment, actually) was really just an interesting aside; it has little to do with the overall energy budget as mapped out in Kiehl and Trenberth (a paper I have looked at more than once in the past; I'm glad you've had the chance to read it). "If there were a "refigerator in the sky" heat would flow from the colder atmosphere to the Solar Oven's focal point where this energy would be concentrated." "For both time periods cooling should be possible because all bodies emit thermal radiation by virtue of their temperature. So the heat should be radiated outward." Ask yourself this: If the atmosphere above were hotter (And sufficiently opaque - let's say cloudy) than the solar cooker, the solar cooker would not cool off by radiating upward. But why? It is not because it stops radiating altogether, because: "all bodies [ with nonzero absorptivity and nonzero emissivity ] emit thermal radiation by virtue of their temperature.". Remember those trees and buildings continue to radiate as well, and that does not change if the temperature changes (unless material properties change as a result - the obvious example is that if the trees get to hot, they'll combust, etc.) The reason the solar cooker would not cool off in that case is NOT because it suddenly stops radiating thermal energy, but because the atmosphere is radiating a greater amount back. Now back to the more usual situation: The atmosphere does radiate some thermal energy back to the surface, because it is not 100% transparent at all relevant wavelengths, and it is not so cold as to be at absolute zero. If it were that cold, or if it were 100% transparent so as to reveal to the surface the entirety of the dark of space, that solar cooker would cool off much faster - not because it radiates more, but because it would now recieve essentially ZERO radiation from above. Imagine the Earth's surface is a hot magma ocean (it may well have been that shortly after planetary formation). Suppose it is glowing red hot, as we would expect based on it's temperature. Suppose the atmosphere is such that some of this glow is visible from space. This is the thermal radiation emitted due to the Earth's surface's temperature. But it is only red hot - it cannot cool to the sun, which is about white hot. Does this mean that the Earth is not visible from the sun? Not easily, but you'll still see it with a good enough telescope - let's say you're a superhuman with a super telescope and both survive such conditions. Photons from the Earth are reaching the Sun. There is a flow of heat from the Earth to the Sun. It just happens to be less than the flow of heat from the Sun to the Earth. The Earth is cooler than red hot, but it does emit thermal radiation to space, and a small fraction reaches the sun - it is only small because the sun does not surround the Earth but only fills a small solid angle as seen from the Earth. 2. The Earth's molten core." "If these two energy sources were elliminated, the Earth would cool to near absolute zero." Why would the Earth cool if energy sources were eliminated? Might it be because it would continue to radiate to space as a function of it's temperatures, rather than simply shut down such radiation as a result of the loss of the sun? "All the energy radiated by the Earth and the atmosphere could still NEVER EXCEED the 342 w/m^2 Solar Energy!" Using Kiehl and Trenberth's numbers, because only 235 W/m2 are absorbed by the Earth, only 235 W/m2 can be emitted by the Earth to space - if the temperature of the Earth is not changing (ie there is no net gain or loss of heat, or sufficient rearrangements of heat energy, etc...). But that is the radiant flux to and from the Earth as a whole, including the atmosphere. The entirety of the 390 W/m2 radiated by the surface does not go to space; the great majority is absorbed by the atmosphere. To a first approximation, none of the backradiation from the atmosphere goes to space, either. At no point in Kiehl and Trenberth's diagram is energy being created or destroyed (except the sun - but that's a conversion of energy, not creation ex nihilo) or is the second law of thermodynamics being broken. What happens when you take 1 gram at 150,000 K and toss it into a pile of mass 30,000,000,000,000,000 g. What is the temperature change of the 30,000,000,000,000,000 g? Assuming similar specific heat values, it would be around 0.000000000005 K.
Forget the last two paragraphs; that was prep work to come up with an appropriate comparison.